One of the complimentary services that our school offers is to find suitable accommodation for our students.There are various alternatives from which you can choose and we, at the Leonardo da Vinci School in Florence, are here to help find the best solution for you. The choice of accommodation depends on the needs of students and the availability of apartments. 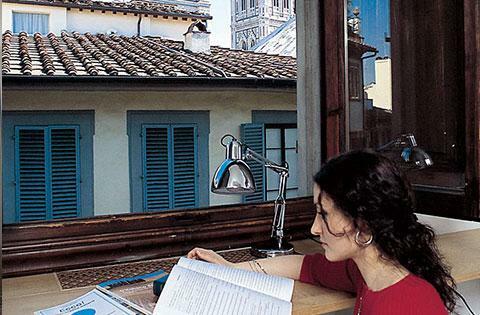 If you want to get to know a lot of people, both Italian and foreigners and share your experience of studying Italian in Florence with them, you may prefer to choose to stay in a shared apartment (only recommended for those under 30). If on the other hand, your objective is to make the most of your stay in Italy and you want the chance to get to know the Italian culture and way of life as well, you may perhaps prefer to choose to stay with an Italian family. In both cases, you can choose whether to have a single room or to share a room with a travelling and studying partner (we don't guarantee availability of a shared room if there's no match). Alternatively, if you're looking for peace and independence, we can help you find a private apartment.